In case you didn't notice it's Spring time, look at this. I took it late this morning in Shuwaikh. The little flowers were in a pot and the surrounding area was full of butterflies. I don't know what family this butterfly is from, but I know I've always seen it in Kuwait. I have many childhood memories of this exact colour. I remember catching them and placing them into jars - only to watch them stop moving a while later. Before you write to the UN, we were five or six at the time. I promised the family I would buy these flowers in the hope of attracting butterflies into our garden. 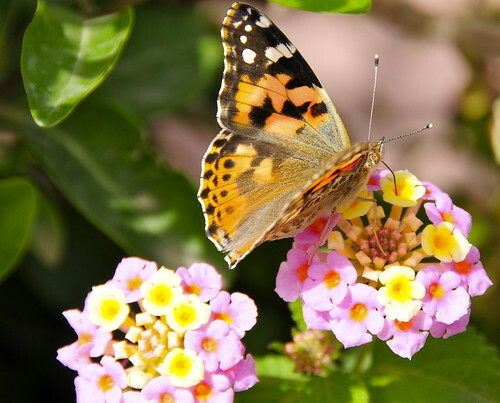 The flowers are called Lantanas & the butterfly is called Plain Tiger. I remember seeing them too! Getting them to stay alive is difficult in Kuwait's atmosphere! It really is. A photographer's dream. You have to look hard to find them... Glad the sparrows are here year-round. We need more gardens! In London, the number of sparrows is declining each year because there aren't enough quiet places for them to breed.